With the onset of autumn, festival season starts in India and along with it starts Wedding Season too. Yes ! it's a season in itself, Navratri marks the beginning of auspicious period in Indian calender(Lunar calender is followed to calculate dates of most of the Indian festivals), followed by a list of festivals. Weather is perfect, time is auspicious so most of the weddings in India take place in Oct.-Dec. Though Jan. & Feb. also come under the category of auspicious time for weddings but it gets really cold during those months specially in North. Note : Whole process of making Mathis will take around 1 hr. So, make sure U have that much time before U start with it. Usually for weddings & festivals these are fried in desi ghee/clarified butter, but I don't have guts to do that so I stick with canola oil only. NOTES FOR THE DOUGH : To get the best result which in a lay man language means "Khasta Mathi", make sure dough is tight/hard. Khasta means when U break these cracker kind of Indian snack, it breaks but with little flakes. To achieve that result we don't need soft dough, so use only little water at a time as each flour have different water absorbency capacity so U might not use the whole water mentioned above or U might need 1 tsp. or so more. To check if it's hard enough, insert a finger inside the dough once it's kneaded, if the hole made by your finger stays as is, you are good to go. Also, once the dough is done it won't look like very smooth dough. Always keep the dough covered. First of all take some big mixing bowl or better if you have Indian style Paraat(a shallow pan with 4-5 inches high sloppy edges). 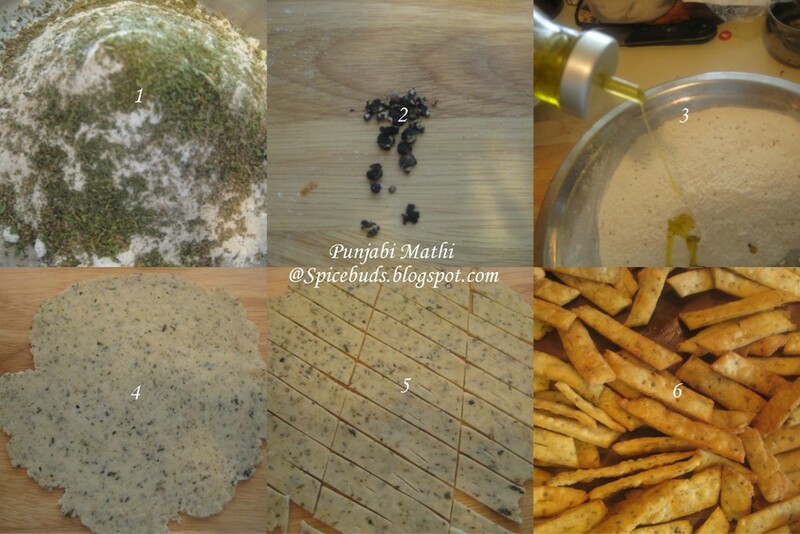 Transfer 2 cups flour, salt and ajwain in it & mix it with your hands. Next come ghee, make sure it's cool before you pour it over the flour. Rub the ghee into the flour using your hands. 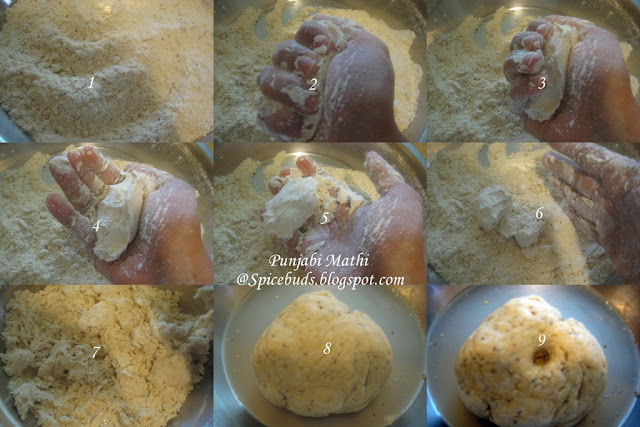 Once rubbed nicely, take handful of flour & make a fist, open it if the flour maintain the shape of your fist when U open the fist means it's good. If it's too crumbly add little bit more ghee. Now using only little water at a time knead it into a hard dough, it might feel crumbly in the beg. but don't loose your patience here. Keep working on it & it will come together, it might not look very smooth dough but that's what we want, a hard dough. Cover it with a plastic wrap or wet(squeezed) towel & let it rest for 10-15 minutes. When ready to fry start heating the oil in a karahi/wok or deep pot on med. to med. high heat, do not use high heat. While it's getting hot take a fist full of dough, roll it into a snake/log of not more than 1 inch thickness. Cut around 1/2 inch length disc from that log. Now take one disc flatten it & using rolling pin roll it(not too thin around 1/4 of a cm.). Repeat it with all the disc. Using a knife make 1-2 small cuts on the flat disc or alternatively use fork to prick the disc, this step ensures that when you fry the mathis they don't fluff up like poori or bhaturas. Also when U roll the mathis/disc if dough is of right consistency U will never get the smooth edges they will be little broken or kind of fray looking which is perfectly normal. Check the oil temp. by dropping a tiny piece of dough, if it gets all the bubbles around it and goes to bottom & come back to the top quickly means oil is ready(sorry no oil thermometer in Indian kitchen, but this trick works like a charm). If it stays at the bottom it's not hot enough. If the piece of dough gets too brown very quickly means oil is little too hot U might wanna turn the gas off for few minutes. Once the oil is ready drop rolled disc one by one into the hot oil (do not over crowd them in oil bath) & deep fry them till they are light brown in color, turn them & let other side also get cook & get the light brown color. DO NOT FRY ON HIGH HEAT, as that will make outside to cook quickly & inside will remain still soft. While first batch is frying roll the second batch & so on. Repeat the process till U are finished with the dough. Once they are completely cool store them in air tight container, preferably not transparent type. WHY ? because otherwise they will be gone in a day :-) everyone likes to munch on these before after & in between meals. NOTES : If U are not comfortable rolling & frying side by side, in that case either call your husband to do the frying part OR otherwise roll all the disc/mathis first and keep them covered away from gas & fry them in batches. VARIATIONS : I usually make two batches, the one given above. Other one is with extra virgin olive oil instead of ghee and with few more spices : coarsely crushed black peppers + dry methi leaves crushed(Kasuri methi) + garam masala. If U prefer you can put whole black peppers, that's what normally Punjabi mathis have but my kids will take that black stuff out from each mathi they eat so I started to put coarsely crushed & they don't mind that at all. To get the perfect rounds U can also roll one big disc & then cut small circles out of it using cookie cutter or just right size(1.5-2 inch) cap of some bottle etc. but I like the organic look of rough edges. 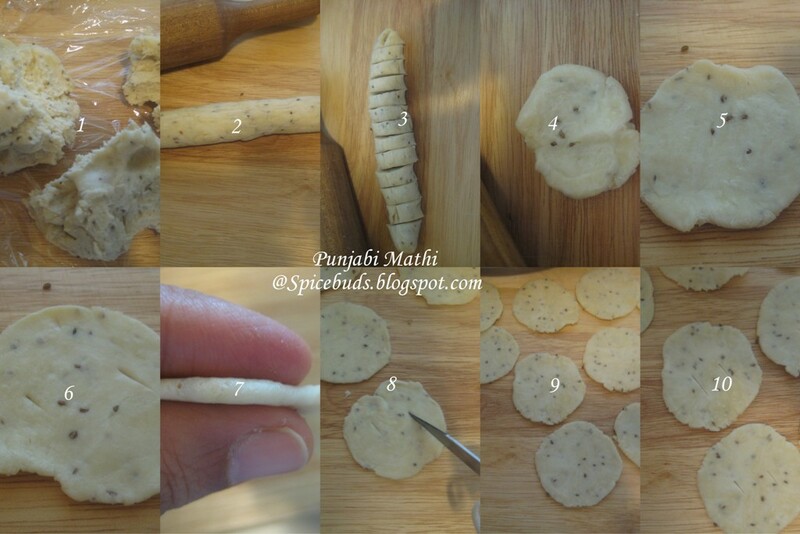 Instead of making round mathis if U want you can make them into diamond shape known as nimki in some parts of India or long strips which are called namakpare(common in Delhi) or sankhein (i heard this term after my marriage from my MIL who lived in Rajasthan after her marriage). For these make one big disc & then cut them into strips & further into small around 2-3inch pieces(picture above will give you more clear idea). Enjoy them as is or with a hot cup of tea. Make an extra batch, pack in a nice box & take with you, next time you visit your family or friends. Wow they looks super crunchy and crispy,thanks for sharing..
Love your turorial; have never heard of this but very interested. Thank you again and studying your lovely book. Gosh!!!!!!!!!! U are making me drool over these matthis.......matthis with achaar in this rainy season.....heaven. I'll probably have to spend more time in the kitchen now making these beauties. Thanks everyone, Alpana, yes these were suppose to appear on this blog with achar masala only but my cameras battery died & was too lazy to charge it so just posted with Pics I had taken while making them. Have to try this out soon...looks addictive and perfect with a hot cup of tea. wow, they look amazing, superb !!! 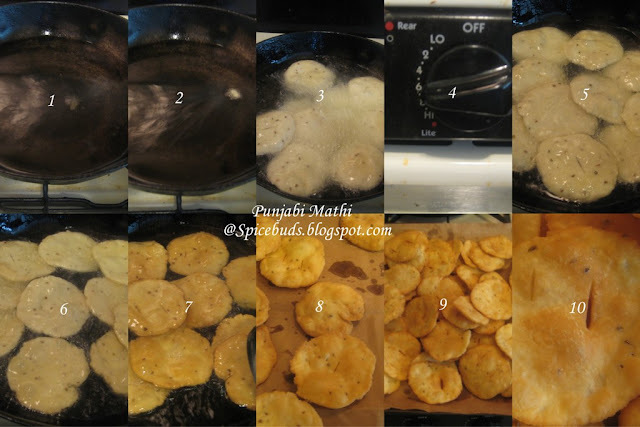 Super addictive munchie... Love the step-by-step pics..
you are welcome in my space too..
wow they have come out so crispy and yummy! Crispy fried Mattis.. Looks perfectly done!! Mmmm deliciously crispy. Thank you for sharing will continue to make some more.